Mythology of yore teaches that when Perseus cut off Medusa's head, the blood sinking into the earth produced the magnificant winged horse, Pegasus. Other pieces of the legend name Zeus as the father of Pegasus. Ancient Greek legend tells us that Pegasus often wandered, stopping to rest on Mt. Olympus. One day, when his hoofs touched the ground, four springs of water formed and from these springs the Muses were born. The Muses were the nine beautiful chosen goddesses that reigned over the liberal arts and sciences, especially music, poetry, and all of the visual arts. Minerva (Athena) caught and tamed the wild Pegasus and kindly presented him to the Muses. Pegasus, being the horse of the Muses, has always been at the service of artists. One poet, Schiller tells a story of Pegasus being sold by a needy poet and put to the cart and the plough. He was not fit for such service, and his ignorant master could make nothing of him. But a youth stepped forth and asked if he could try to ride him. 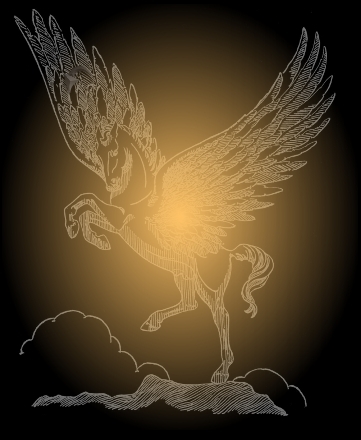 As soon as he was seated on his back, Pegasus, who had appeared vicious at first, rose kingly, a spirit, a god! He unfolded the splendour of his wings and soared towards heaven. He can still be seen as the star constellation, Pegasus. "...I will not change my horse with any that treads but on four pasterns. Ca, ha! he bounds from the earth, as if his entrails were hairs; le cheval volant, the Pegasus, chez les narines de feu! the basest horn of his hoof is more musical than the pipe of Hermes."